SOUTH BEND, IND.- The Snite Museum of Art presents Chicanitas, Small Paintings from the Cheech Marin Collection on view beginning Sunday, September 4, 2011. This exhibition showcases 65 paintings by 26 painters represented in Cheech Marin’s noted collection of Chicano art. Marin, the entertainer well known for his work in movies, television, and improvisational comedy, has been acquiring art for more than 20 years, and he has amassed one of the most renowned collections of Chicano art in private hands. The Chicano art movement arose in California in response to the political, cultural, and labor causes of the mid-1960s to mid-1970s. Inspired by the struggles of migrant farm workers led by labor organizer César Chávez, Chicanismo evolved into a general political and cultural revolution within the United States, stressing political self-empowerment, an assertion of cultural pride, and an affirmation of ethnic identity among Americans of Mexican heritage. The Cheech Marin Collection includes a number of widely exhibited works from the 1980s and 1990s by such first-generation Chicano artists as Carlos Almaraz, Margaret García, Frank Romero, and Patssi Valdez, whose artistic careers began during the Chicano civil rights movement. Many in this generation were political activists, creating posters, graphics, and murals in the monumental tradition of Diego Rivera. Others convey Chicano experience through scenes of daily life in the barrio, expressive portraiture, and surrealist-influenced dreamscapes with a keen psychological edge. The paintings herein are whole, entire and complete unto themselves. There is great power in clarity, and the featured artists have distilled the essence of their individual visions into a format that speaks clearly the message that they want to convey … in other words “size doesn’t matter” – it’s what’s inside the frame that counts. There is something about the intimacy of a small painting that draws you in and implants itself is the warmth of your memory. For the collector, the small paintings are the ones that remain with them throughout their lives. They are the paintings that are always in their bedrooms or their kitchens or whatever room in which they spend the most time. The owners know every square inch of these paintings and can almost see them in the dark. In Chicanitas, several young artists are getting their first national exposure. These paintings are their calling cards and they speak with eloquence, style, and clarity. Enjoy! Mekhi Phifer and Cheech Marin will guest-star in an episode of Psych, TVGuide.com has learned exclusively. Phifer, who stars as a not-so-dead dead man on Torchwood: Miracle Day, will play Drake, a member of "Blackapella," the a cappella group Gus (Dulé Hill) belonged to in college. Drake comes to town to honor Deacon Jones (Up in Smoke's Marin), his mentor from childhood. But the deacon is shot while receiving the honor at the local community center, and the group steps in to help Shawn (James Roday) and Gus investigate. Jaleel White and Kristy Swanson will reprise their roles as Tony and Marlowe, respectively, in the episode. Liza Lapira, who's set to guest-star in ABC's midseason comedy Apartment 23, also will appear. Psych returns for its sixth season on Wednesday, Oct. 12 at 10/9c on USA. The Cheech and Chong Animation Movie may actually see the light of day. Tommy Chong revealed that he and Cheech have finished recording a weed song for the film this past week. This film was created using entirely of old Cheech and Chong bits to create a story. Not really sure how that's possible. Cheech Marin and Tommy Chong each received an upfront payment of $100k for this film. 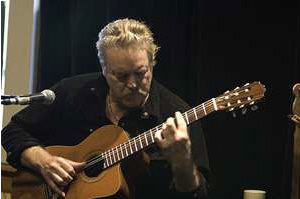 The legendary guitarist, Gaye Delorme, passed away on June 24th after years of declining health. Gaye wrote Earache My Eye and numerous other Cheech and Chong songs and sketches. The Vancouver Sun interviewed Tommy Chong about his memories of Gaye. “When I met Gaye, I had just started the Cityworks Improv Company at the Shanghai Junk [nightclub in Chinatown]. It was like fate, the universe put us together. Gaye was really part of the original cast. He was a writer for the comedy, he actually wrote the first bit we ever did. During the interview from his home in California, Tommy Chong discusses how Earache My Eye was written. Chong's version of the story constantly changes, similar to the way explanation of how 'Dave' was written constantly changes. There will be a tribute to Gaye Delorme this Sunday from 5-9PM at the Yale Hotel in Vancouver. Tommy Chong will not be attending. Buzzine interviewed Tommy Chong who was at the Vanguard in Hollywood, California filming the television show The Green Room with Paul Provenza. Durring the interview, Chong says there are only 11 more Cheech and Chong shows and then he's free. The second season of ‘The Green Room with Paul Provenza’ premieres new episodes on Showtime every Thursday night at 11:00 p.m. ET/PT beginning July 14, 2011. 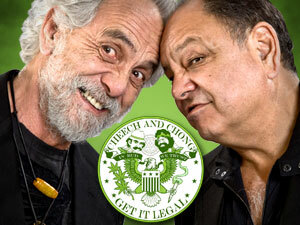 The Cheech and Chong: Get It Legal tour is coming to Primm, Nevada. Tickets go on sale this Tuesday via the Ticketmaster link above. George Lopez' show, Lopez Tonight, has been canceled by TBS. He's a funny guy and sure, he had Cheech and Tommy on there multiple times. However, when the George Lopez show was on the air, his publicist emailed us looking for free Cheech and Chong merchandise. We said we would if the merchandise would be featured on the show. His publicist agreed. We sent him tons of free merchandise. The items were never featured on the show. His publicist denied he made such a promise. I forwarded him the emails. He stopped denying it, but he implied that his company also represented Cheech and implied he'd cut off my access to Cheech information. Years later, George Lopez' wife gives him a kidney and then they get divorced. Classic! Stacy Keach has joined the cast of Universal's fourth installment of the Jason Bourne franchise titled "The Bourne Legacy." According to Variety, Jeremy Renner has been cast as the lead. Edward Norton, Rachel Weisz and Oscar Isaac have also been cast. Joan Allen and Albert Finney will be reprising their roles from the previous Bourne trilogy as CIA agent Pam Landry and Dr. Albert Hirsch, respectively. Plot details are being kept under wraps except that the new lead character would not be Jason Bourne but another assassin who went through the same training that Jason Bourne went through. Cheech and Chong fans may best know him as Sargent Stadanko in Up in Smoke and Nice Dreams.